22-Mar-2017 -- In December 1999 I made the first recorded visit to this Degree Confluence Point. This was during the time of GPS "Selective Availability", so I’ve long wanted to make a return visit, to get ‘all zeros’ (as well as better photos). However, starting in the early 2000’s, Puerto Blanco Road - which passes close to the point - was closed to the public, due to the danger posed by armed smugglers of illegal aliens across the nearby Mexican border. Fortunately, however, illegal activity in the area has recently subsided, and Puerto Blanco Road was recently reopened, and in 2015 there were two new visits to this point. So, finding myself in southern Arizona once again, I decided to revisit this point. As before, I drove counter-clockwise around Puerto Blanco Road (much of which is one-way) until I reached its closest approach: 0.87 miles east of the point. I pulled off the road here and began hiking. Fortunately the weather in early Spring was mild - only 77 degrees Fahrenheit. I hiked across the desert, evading numerous cactus, and eventually hiked up a small ridge. The degree confluence point was just beyond the top of this ridge. When I first visited this point, in 1999, it was one of the first degree confluence points that I’d ever visited. Since then I’ve visited hundreds of other points around the world. Returning to this point, however, made me realize that this is one of the most beautiful degree confluence points that I’d visited. 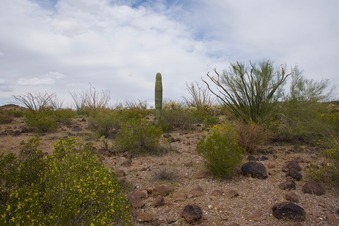 It is surrounded by several varieties of cactus - including Ocotillo (not a true cactus), Cholla, and of course Saguaro. (However, the park’s namesake "Organ Pipe Cactus” - although present elsewhere in the park - does not seem to be growing near the point.) Furthermore, having visited in early Spring, I found that many of the cactus were in flower. Should you get the chance to visit this point (or just Organ Pipe Cactus National Monument in general), then I recommend visiting at this time of the year. I would have liked to have flown my remote-controlled quadcopter (‘drone’) to get an aerial view of this point, but unfortunately drones are banned from National Parks and Monuments. The state border with Mexico is passing about 4.2 mi (6.8 km) SSW of the Confluence.